It is a new fabric which attenuates the electromagnetic pollution, removes electrostatic charges and generates negative ions. ORGON.INK combines two actions simultaneously, one active and one passive. The fabric which contains TURMAL.INK (tourmaline) reacts with the movements of the body and interacts through the far infrared. In this way, beneficial negative ions that fight stress are realeased. The composition and special weaving of metallic fibers, together with the grounding device, act on the present electromagnetic and electrostatic pollution, catching and deriving it to the ground connection in a natural way. The bioceramic mineral is capable of generating negatively charged ions (anions), whose presence in the environment is directly related to health benefits, rest and the feeling of wellbeing. The ‘earthing’ or the ground connection. It allows the body to conduct free electrons that emanate from the Earth’s magnetic field. It has a low semi-discharge time with good electrostatic charge dissipation capacity. 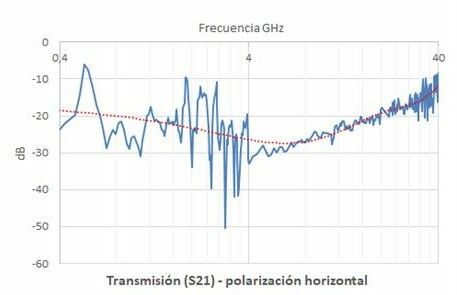 It attenuates the transmission of the horizontal component of EM radiation. It is a mineral with the ability to emit far infrared rays. Tourmaline is a mineral belonging to the silicates group and that among its characteristics should be noted its pyroelectric and piezoelectric effects (tourmaline crystals are energised when heated, rubbed or compressed; one end of the crystal acquires positive polarity and another negative). By this means this bio-ceramic mineral is able to generate negatively charged ions (anions), the presence of which in the environment are directly related with health benefits, improved rest and a feeling of well-being. In fact, in environments such as waterfalls, forests or along the sea shore there are large concentrations of negative ions, whereas in environments near computer equipment, offices, enclosed places or areas with very low humidity there are concentrations of positive ions. Negatively charged air stimulates growth and the proliferation of cells. Even on a domestic level there are air conditioning units equipped with ionisation devices that favour the formation of negative ions. The benefits and effects of bioceramic materials on organisms have for some time been investigated and confirmed by different studies (e.g. F. Vatansever et al., 2012 or Leung TK, 2015). 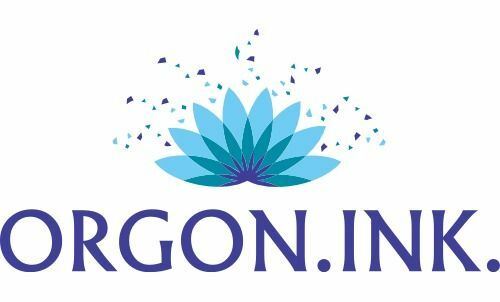 The ORGON.INK fabric has an emission capacity of negative ions (anions), with an average emission rate, measured while continuously rubbed (with controlled force and rhythm), of more than 1,100 anions/cm3 of air. The tourmaline that is incorporated in the ORGON.INK fabric, likewise, is a mineral with an emission capacity of far infrared rays (FIR). This type of radiation has a high energetic capacity and the benefits to health contributed by the oxygenation of the fabric and on cellular stimulation has for some time been investigated (e.g. Pooley M. A. et al. “Engineered emissivity of textile fabrics by the inclusion of ceramic particles” Opt. Express 24(10), 10556–10564, 2016). At a textile level solutions are currently being developed, based on both synthetic fibre additives that include bio-ceramics as well as finished products that incorporate minerals, which induces the fabric’s infrared rejection capacity, providing the final user with benefits to their health and well-being, especially in terms of better muscular oxygenation, a higher capacity of rest or more stimulation of blood circulation (e.g. D. M. Anderson et al., 2017). Contrary to what it may seem, there is no one who is especially sensitive to the effects of static electricity but rather persons who may have a greater tendency to accumulate more electricity in their organisms (for having a larger corporal volume, for wearing clothing and shoes made from synthetic materials, etc.). The problems generated by the accumulation of static electricity may be minor (small sparks, shocks or cramps) or additionally they may have more serious consequences related to the user’s work environment and to the protective clothing they wear while working. The combination of sparks + explosive atmosphere may have serious consequences, since under certain physical conditions explosions may be provoked with a very high potential to cause serious harm. 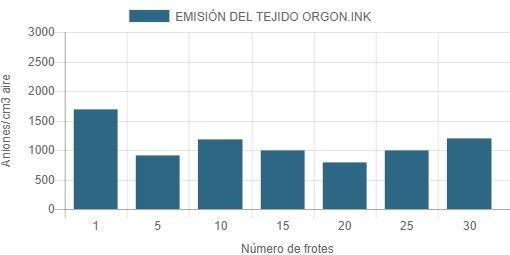 The ORGON.INK fabric has an extremely low decay half-time t50 (this is, the rapid discharge of electricity that is produced by the induction of a determinate electric field) and has a value of S near to 1.0, with a very good capacity to dissipate an electrostatic charge. The accumulation of an electrostatic charge, as well as the continuous exposure to electrostatic fields have quantifiable effects on an organism and on living beings in general. In addition to affecting the quality of sleep and rest, electrostatic charges can alter the metabolism, delay growth or reproductive cycles, or alter the germination of plants, (e.g see Schmiedchen K. et al., 2017). In any case, studies continue to investigate and validate the said effects in cases of prolonged exposure. EARTHING or the connection to ground. Related to the flows of electric charges that pass through the body, over the last few years a movement has emerged, known as ‘earthing’ or ‘grounding’, that affirms that walking barefoot and being “grounded” allows the body to conduct free electrons that emanate from the Earth’s magnetic field. In this way, the accumulation in the body of an electrostatic charge is avoided, thus synchronizing the body’s biologic clock with natural diurnal rhythms. ORGON.INK fabric has its own grounding system that allows for the efficient discharge of static electricity, thus taking advantage of the benefits that a ground connection provides. In this way, it improves sleep and helps the user to awake well rested and full of energy. The benefits of ‘earthing’ have been reported in various studies (e,g. as published in the Journal of Environmental and Public Health); listed and described in them are the different health aspects that can be modified by the practice of grounding to earth: including sleep, chronic pains, stress levels, variations of cardiac rhythms, glucose levels, etc. The levels of electromagnetic radiation (EM), produced by the combination of electrical and magnetic fields, have undergone exponential increases with the increased prevalence of new technologies such as WiFi, Bluetooth, GSM and UMTS for example. Although there are still no conclusive results on their impact on health, in 2011 the WHO classified the EM radiation emitted by mobile devices as possible human carcinogens. Previously, the European Union had already launched various studies in this regard (e.g. Scientific Committee on Emerging and Newly Identified Health Risks – SCENIHR. “Possible Effects of Electromagnetic Fields (EMF) on Human Health”. 2006), and updated in 2015. From non-woven fabrics, to blankets, and even jewellery, there are more and more products designed to protect and shield against EM radiation, especially in Europe where there is a greater awareness of electromagnetic emissions. The said protection and shielding is generally achieved by the utilisation of metals that have the capacity to absorb or reflect EM radiation of different frequencies that a user may be subjected to. In the case of the ORGON.INK fabric, the electromagnetic shielding capacity is attained by a combination of metallic fibres included in the fabric’s composition and a special weaving structure. With this combination of metallic fibres and special weaving, the ORGON.INK fabric provides attenuation, principally in the transmission of the horizontal component of the EM radiation, quantified as between -10 and -20 dB (90 and 99% of the radiation) as a function of the incident frequency (from 400 MHz to 40 GHz). As with the accumulation of electrostatic charges and to the prolonged exposure to electrostatic fields, investigations and work continues on demonstrating and validating the effects on health that result from exposure to electromagnetic radiation. In any case, having solutions and products that help alleviate the effects of the said exposure is of interest to the final user, in view of avoiding excess electromagnetic contamination that may negatively influence their health, well-being and rest. 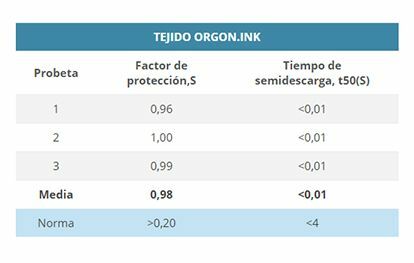 The ORGON.INK® fabric displays significant and positive results with respect to the three technical properties that have been studied and evaluated. Taking into account that in the bibliography are found different references with respect to the positive impact that the said properties may present to the user’s well-being, the quality of their sleep, of their rest, etc., the ORGON.INK® fabric can be used in final product applications of interest in the leisure sector.